LAKEVILLE, IN. – Sometimes it’s the “little things” in a high school game that can help turn the tide. 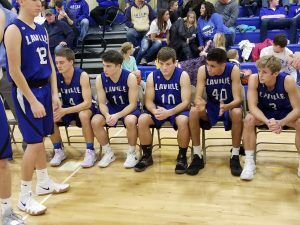 Class 2A #5 LaVille was able to take advantage of some timely plays en route to a 49-33 high school basketball victory. The Lancers continued to clamp down on defense, allowing Argos to a season-low 33 points and the best defensive effort so far this season for LHS. There was a heart-stopping moment in the game when LaVille forward Rilye Cox went up for an errant pass and came crashing down to the floor. Cox left the game and was check by LaVille Athletic Trainer Gary Hall before returning. Cox returned to score a season-high 19 points to go with 11 rebounds. It was the first home game of the season for LaVille. The Lancers started the season on the road against a much-improved South Bend Career Academy squad, rival Bremen, and Rochester. There were several players that made big plays either offensively or defensively along the way. LaVille point-guard Connor Wieczorek hit some big shots to finish with a season-high 15 points to go with five rebounds and four assists. “Connor is definitely a spark plug for us,” concluded Edison. “He gets us going both offensively and defensively. He is super fun to watch on the defensive end because of his reaction time and the way he anticipates what is going to happen. He gets a lot of deflections for us and takes the other team out of what they are trying to do. He was able to drive to the basket and finish at the rim on multiple plays last night. He also stepped up and hit a big 3 pointer for us. He did a little bit of everything for us! Riley Wagoner picked up several key rebounds and scored his first bucket of the season, while Cox had a highlight-reel moment, stealing the ball at half court and dunking the ball to get the Cox Gymnasium crowd fired up. Jared Beehler hit a deep three to put the Lancers up in the first quarter, and Luke Beehler dropped in 13 points, including a key 3-point bucket. “Essentially, I was very happy with our focus and mindset entering the game last night,”said Edison. LaVille improved to 4-0 overall and will open Hoosier North Athletic Conference action Friday at Winamac. The girl-boy HNAC doubleheader will start the girl’s game at 6:30 p.m., with the varsity boys to follow.